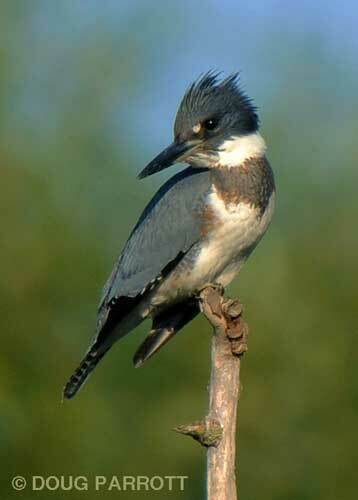 Belted Kingfishers were born to kvetch. They can’t seem to go anywhere or do anything without a running commentary, pitched loud, raucous, and endless. My favorite female kingfisher, for example, never flies silently. Yesterday, she was flapping around Paulson Prairie kvetching with every flap. Last autumn, we found her perched in a snag at East Point. Every few seconds, she would raise her tail and make a comment. The tail-raising seemed to fan her temper. I love that little gal. Kvetching, you see – contrary to what the online dictionaries say – is not ordinary complaining. It is complaining raised to an art form. In the military, they call it griping. Among the English upper crust, I believe it is called grousing. Kvetching is not meant to be taken seriously. In fact the word “kvetch” is a Yiddish word derived from the German for “squeeze.” Think of squeezing a toy and hearing a kind of eep-y protest. Kvetching is like that. No one – least of all the kvetcher – expects the listener to do anything to make a squeeze toy’s life better. We can thus just stand back and admire. As I did last year when my favorite female flew into the dead willow snag at the north end of Main Pond. There she stood, kvetching continuously as she studied the water below, looking for a fish. Unfortunately, a Cooper’s Hawk was drawn to the sound of her voice and came rocketing in. With one especially loud squawk, the kingfisher sprang into the air and flew around and around the pond, keeping just barely out of reach of the hawk. Kvetching all the while. Then in a virtuoso display of flying technique, she executed a loop-the-loop and got behind the hawk. Instead of flying off safely, though, she went after the hawk, pecking him in the behind with her powerful beak. Kvetching all the while. The hawk, completely cowed by this attack, fled, leaving behind one feather that floated gently down to land on the water. The kingfisher returned to her perch, fluffed out her own feathers, and settled down to hunt for fish again. Kvetching all the while. You can’t help loving a soul like that. This entry was posted in Uncategorized on July 2, 2010 by constancesidles.